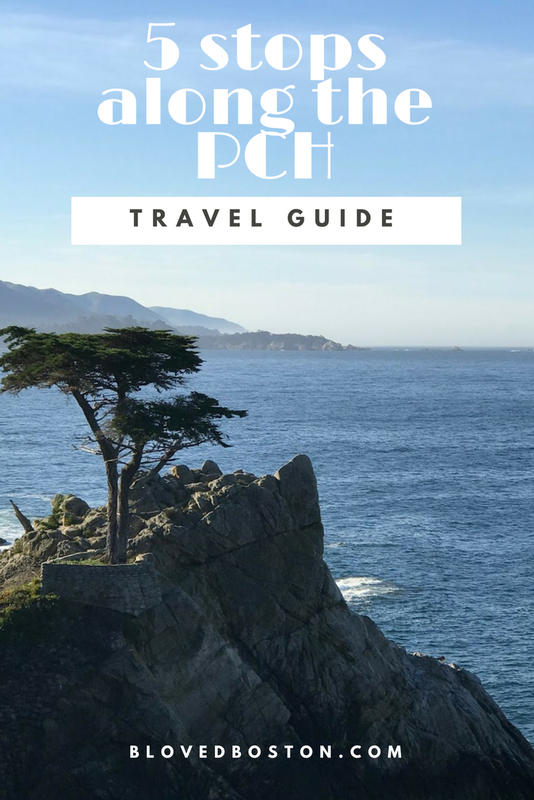 Planning the PCH road trip was definitely fun, but daunting because there are so many little towns and scenic vista points that you can pull off at to take in the views. Before tackling the Napa & San Francisco travel guides I wanted to share my favorite stops we made along the highway. Malibu || Just 30 minutes outside of Santa Monica, Malibu is situated along 27 miles of coastal beauty. Amazing homes, beaches & great shopping - this basically sums up Malibu for me. Before stopping for lunch we went to the Malibu Country Mart which is anything but country. It's an outdoor shopping mall with high end designers and quick, but delicious eateries. In an effort to see more of Malibu we went to Paradise Cove & ate outside at the cafe for lunch- then took a little time to walk around the beach. Solvang & Santa Ynez Valley|| You could take or leave Solvang which is a Danish settlement in the Santa Ynez Valley complete with windmills and all. We made our way to Solvang via the valley after Santa Barbara which is about a 40 minute drive and the views of the mountains along the drive were worth the trip alone. We only spent about an hour walking through the little town center, but made sure to enjoy an Ebelskiver, a traditional Danish pancake! Elephant Seal Beach || Right before we weren't able to go any further on the road to Monterey - we stopped at Elephant Seal Beach. There were so many of them sleeping & sunning themselves. It was really neat to see and they were adorable! The risk you take doing a PCH trip is that the roads can often close without a warning - this can be due to slides, too much rain or any reason really. Unfortunately for us the road between Ragged Point and Big Sur was closed - meaning we couldn't drive all the way through on Highway 1 on our way to Monterey. So there was some backtracking that had to be done to see Bixby Bridge, but we saw it, which was all I was concerned with. Carmel-by-the-Sea / Monterey || This was actually an overnight for us & one of my favorite stops during our trip. If you've been watching Big Little Lies this is basically where the entire show takes place and it's just as amazing as it seems on TV. We stayed in an Airbnb within the Pebble Beach Community. We were able to catch a sunset at the beach before dinner & it would have been amazing to stay at least one more night to actually enjoy the cute little beach town because the shopping looked amazing, but we'll just have to go back! 17 Mile drive is the stretch of the PCH that is in Pebble Beach Golf Resort. The golf course looks over the ocean & the houses are just incredible. We stopped 10 or so times just to look at all the houses! Usually there is a $10 fee to drive the stretch, but since we were staying within the gated community we didn't have to pay the fee - just an added bonus. Big Sur || I was most excited for the Bixby Bridge in Big Sur. It's the one you see in practically every travel book of California and if you watch Big Little Lies, they drive over the bridge in every episode. Which fun fact - they actually don't have to since they all live in Monterey & there is no need to drive over the bridge for them - I think they do it for effect! For a lot of folks, Big Sur is an overnight stop, usually for a few days because there are national parks, springs & a lot to see and do if you didn't want to overnight in Monterey / Carmel-by-the-Sea. I'm actually pretty happy we chose not to make Big Sur a bigger part of our itinerary because it would have been thrown for a loop with the closures. The one time in my life NOT being outdoorsy came in handy! Morro Bay & San Luis Obispo || The guide book said that there was a "not to miss big rock" in Morro Bay - so we stopped to see the rock. Like I said, if you have the time this town is super cute to explore, but we literally hopped out of the car, took a picture near the rock & then continued on to Pismo Beach. You can drive up super close onto the actual "island" where the rock is, but we didn't. I guess I should say the rock is actually a volcanic plug - so that's what makes it interesting. Santa Cruz || I think a few folks will be surprised that this is a "nice if you have the time" stop for me, but I just wasn't wowed by Santa Cruz. We stopped here for lunch on our way to Napa. It's a super eclectic and perhaps if we would have checked out the boardwalk this would have become a "must see" for me. It does have a few sister cities, including one in Italy & you can see it in the architecture. I also witnessed someone getting arrested which sort of freaked me out causing this to not be one of my favorite stops. Hearst Castle || We didn't have enough time to check out Hearst Castle & didn't make a reservation for tickets ahead of time. If we were to go I would have been more interested in the outside of the property rather than how the castle was decorated so I'm sort of happy that it was overcast because I didn't feel like I missed anything. I know this was super long, so if you got through it, thank you! I did want to mention, that while planning my own trip it was hard to find a full itinerary. I found a few that were 5 or 7 days long, but none that were 10 days. So at the end of all my travel guides, I will be sharing a full itinerary that will basically be a snapshot of everything we did. Your pictures are just all so gorgeous!!! I think the itinerary will be super helpful for anyone interested in planning a trip! So beautiful!! What a fun drive up the coast! We used to live on the 101 in Oceanside, so on the weekends we would drive up the coast to Laguna. It was so much fun! Love all the pictures! I miss Malibu so much. Paradise Cove was my go to every time I had visitors, you just can't beat the view there. So glad you had a great trip! I want to do this trip SO badly! It was once talked about this summer but now the person I was going with is getting married & I have a different summer trip planned, but someday! Your pictures are gorgeous! Cali is so gorgeous! The mix of mountains and beach is perfect and I love how scenic everything is! I rally want the traditional Danish pancakes right now, YUM! And Elephant Seal Beach is definitely on my bucket list! Happy Friday love! These pictures are absolutely stunning Biana! It really looks like the trip of a lifetime, and definitely going on my bucket list now. Have a great weekend! Monterey is one of our favorites! We did a few days there before Napa the last time we were in Northern CA and loved it. Isn't 17 Mile Drive fun? So many great places to take pictures and Pebble Beach is of course gorgeous. Hoping to do the entire Pacific Coast drive one day, there is so much to see! Happy Friday! Brian would move to Carmel tomorrow if he could. We loved it there! Wow, I had no idea that California had so many cool, educational, and fun places to visit! I'd definitely want to visit Solvang and the Elephant Seal Beach of course, haha; they look so cute! What a fun experience, girlie! Thanks so much for sharing all these cool places to visit, I'll definitely have to refer to this post when the time comes! I hope you have a great weekend ahead! I think a trip down the PCH would be so cool. All of your stops look fabulous. I know the seals would be a must for me!!!! I can't hear Pismo Beach and not think of Clueless. i would love to do a big trip like this one day, so this is really handy! that danish town looks so adorable, and how cool is Elephant Seal Beach! that's so weird about the road closures, i had no idea, but it makes sense. This is such a perfect post for me since my husband and I are doing basically the same trip in one month. Just a question regarding the roads closing, can you find out that morning before you start driving if they are closed that day or you just have to start driving and then reroute if you come to a closure? I figure google maps doesn't update daily about road closures...so wasn't sure what info you had about that. We found out about it about a week or so before leaving after stumbling upon an article. There is a radio station that details road closures, but honestly this was the only one we dealt with so I think you guys will be okay. I hope it's opened for you when you and your husband go! BAHAHAH "The one time in my life NOT being outdoorsy came in handy"!!! Love it!! And your pictures are gorg!! Looks like you had great weather! The elephant seal beach looks amazing! So cute how they all just lay in the sun all day! :) This looks amazing. That sunset!!! Wow! This is definitely something Mark and I have talked about. Saving all of these for future reference! I visited Malibu years ago, on our way to Disney Land and it was gorgeous! I want to go back to Cali so bad! Carmel was my BFF's favorite too. We did the drive north of San Fran a little ways instead of south, so south is still on our list! Each photo is more beautiful than the last!! Just gorgeous! Pinned it on my Favorite places and spaces" board!! The PCH is one of my favorite places in the country! I've always loved the ocean, so there's no better highway to me. Monterrey and Elephant Seal Beach are the best! You all had such a great trip!! I'm putting this on our trip wish list because it looks so fun! You must have had amazing time, these are beautiful photos. You guys are a cutest couple, and how gorgeous is that sunset. What a DREAM!! So many amazing things!! When we drove up the coast we didn't get to go as far north as y'all did, but man, do I want to now! What an excellent trip and drive! Last time I was there we only stopped in Malibu. I want to go back and make all of these stops! You're vacation looks like it was the absolute BEST!! I'm loving every single picture you share! Malibu is the best - so relaxing and peaceful! So jealous that you stayed in Carmel/Monterey - we stopped there once years ago and it was sos pretty! Loving your recaps! I've only been as far north as Malibu...looks like I need to plan another trip! Yes!!! I've been to Carmel-by-the-sea AND Monterrey! I loved how beautiful it all was!!! Were you able to make it over to Yosemite? Such a dream of a trip and you did it right with a convertible to explore the scenery. Dying to explore the PCH...I'm sure it was difficult pinning down the spots to stop at but you sure did catch some beautiful scenes and the little Danish town looks so cute. Looks like so much fun!! Stunning shots! I love that you're breaking this all down - makes it so much easier for those of us that want to do a similar trip in the future! ;) You got to see so many unique towns. My grandma lived in Carmel for a time when she was younger, so I always have wanted to visit and hopefully find the house that she lived in. It does look gorgeous there! I wish I had found your guide before we did this drive. We definitely should have done more planning to take full advantage! It's gorgeous. YES to all of these! Pismo Beach is also another random favorite of mine on the PCH. Hearst Castle is also a definite stop next time and the Redwoods, too! Monterey is beyond and I love that you stayed in Pebble Beach!! Carmel by the Sea is on my travel bucket list, along with Big Sur. I've day tripped along there, but I want to stay the night. Your pictures (and IG stories) are stunning from that area!! This is making me want to go back to California right now! When we did our NoCal trip a couple of years ago we drove from San Francisco on the PCH to Big Sur and I'm so glad that we did. It easily became one of my favorite parts of the whole trip. I also can't resist yelling at the screen during Big Little Lies that we've been there every time they show Bixby Bridge! And Santa Ynez Valley looks so pretty, and I love seeing all of the Dutch culture in that small town. And with as many times as I've been to LA, I still haven't been to Malibu! I guess that gives me a reason to go back! So much beauty! I wondered if you guys went to Monterey when we watched Big Little Lies-- I still can't get over how stunning it looks! The PCH is SOOOOO pretty! Monterey and Carmel by the Sea are two of my favorite stops, outside of all the cafes in Big Sur. What a fun trip!